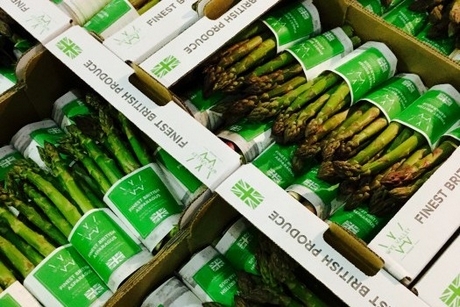 The warm weather at the end of February has brought on the asparagus in the Wye Valley, but it won’t be an especially early season according to Chris Chinn of Cobrey Farms. “The warm weather at the end of February was enough to get us from what was looking like a very late season to being back to average timings, if it had stayed that warm for another couple of weeks it would have kicked it into gear a bit more. The weather is now back to average for this time of the year and the forecast looks like it will stay average for the next few weeks, so we are not expecting more than what we would normally for the time of year. We have a few odd boxes here and there from tunnel production, but not substantial volumes. The official start of the season is 23rd April on St George’s Day through to midsummer’s day.